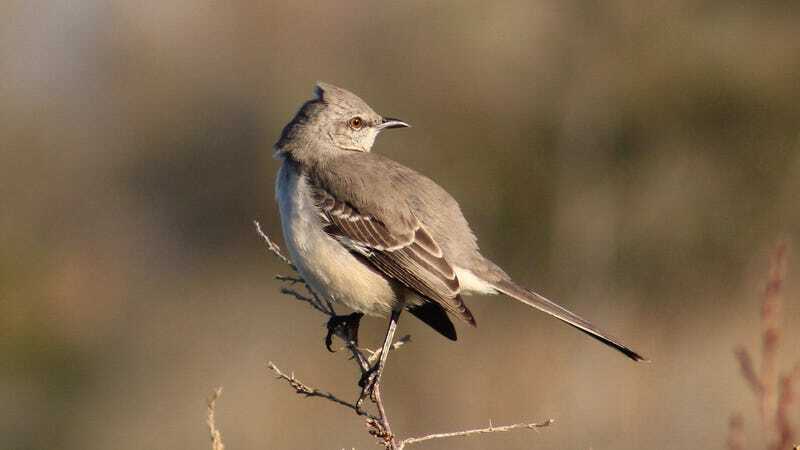 You may be familiar with the aggressive behavior of the northern mockingbird, found throughout most of the United States, Mexico, and the Caribbean. A new study implies that less-than-lethal lead concentrations might make that behavior worse. While not all city dwellers realize it, we share our environs with hundreds of wild avian species, from migratory warblers just passing through to the starlings and mockingbirds pecking at our trash. But urban areas also generate pollution that can harm animals in surprising ways. A team of researchers has now found one more obscure consequence. “While immediate effects on [urban wildlife’s] health are of major concern, these results show that lead pollution can have subtler but potentially just as serious effects in the long term through changes to their behavior,” Stephanie McClelland, a postgraduate research student at the Royal Holloway University of London in the UK, told Earther. Humans have curtailed their lead use, but the remaining effects of lead pollution are still visible in cities or in places where hunters hunt with lead bullets. Scientists are mostly aware of lead exposure’s effects on humans, which include mental impairment, irritability, developmental delays and kidney disorder, and know it can be fatal to humans and birds alike. But it isn’t clear how less-than-fatal quantities of lead, like lead in the soil, can impact wildlife. The researchers used the common, city-dwelling northern mockingbird as their test subject, focusing on three neighborhoods in New Orleans: Lakeshore, Marigny, and Uptown. Lakeshore’s lead content is around two to 49 milligrams of lead per kilogram of soil, while Marigny and Uptown’s lead levels were 300 to 500 milligrams per kilogram—below the US standards for soil but straddling the acceptable upper limit for play areas. The team captured 34 birds on the sites combined, and sampled the birds’ blood and feathers. They also recorded male mockingbird songs in the areas, and introduced a taxidermy mount of a mockingbird in an aggressive position and measured how the birds reacted. The test results revealed that lead levels were four times higher higher in both blood and feather samples for the birds in the higher lead areas than in the lower-lead areas. The birds’ songs didn’t differ, nor did their apparent body size, but the birds in higher-lead areas behaved more aggressively to the taxidermy intruder than they did in the lower-lead area, according to the paper published in the journal Science of the Total Environment. One researcher not involved in the study appreciated its broad scope. “They did a great job evaluating the effects of lead, the birds’ position, singing, and aggressive behavior,” Nicole Michel, senior quantitative ecologist for the National Audubon Society, told Earther. She also appreciated the difficulty of working with wild birds versus birds in a lab, which could potentially give researchers a more accurate picture of the problem. But there’s more work to do—the researchers only studied a small sample of the mockingbirds in one place, and there are multiple factors that can influence bird behavior, explained McClelland. “It will be important for future studies to pin down exactly how it is that lead is causing these behavioral changes and what impact these changes have on urban bird populations over the long-term,” she said. However, she did feel that the results could be generalizable to other birds that we share our city environs with. It’s unclear what impact nonlethal levels of lead would have on other bird species, yet. If you’re familiar with mockingbirds’ loud, aggressive tendencies (a pair of mockingbirds attack my mother and her dog every day, for example), you might wonder what it was like to study the birds in the wild. It was not easy.